We suggest you buy 12-VOLT-5-WATT-SOLAR-PANEL here instead. 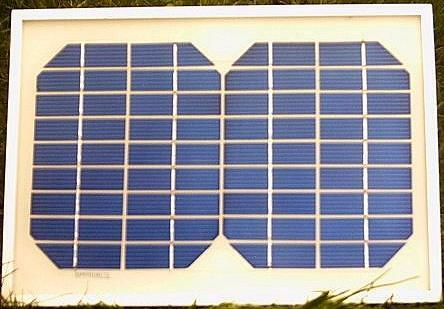 This is an monocrystalline photovoltaic solar panel rated for 12 Volt charging with a peak power output of 5 Watts. This corresponds to a current of below 1/2 Amp, so no charge controller is required. The solar panel itself is made of toughened glass with a hard-wearing weatherproof aluminium frame and rubber sealing. Being completely waterproof it can be safely installed outside. Including the frame, the solar panel is just 290mm x 205mm x 17mm. These PV solar panels are fitted with 5 metre long bare-ended insulated leads, and a blocking diode to prevent stored energy in the batteries escaping through the solar panel at night or under heavy cloud cover.